Guests: Dr. Charles Nilon and Dr. Paige Warren. Topic: This month, while the Café Scientifique is on its summer break, we bring you a wide-ranging conversation about how humans interact with nature in cities, and how scientists study this human-nature relationship. As Dr. Paige Warren notes early in the conversation, Dr. Charlie Nilon, an African American ecologist, is a pioneer in studying ecology in the context of urban systems where humans interact with nature to determine the fate of biodiversity. Both Warren and Nilon have collaborated closely with Katti over the past 15 years in developing a better understanding of the factors that influence biodiversity in cities. This field, the study of how we humans shape our immediate (and distant) environments, and in turn, how other species respond to our actions, holds a key to the future of biodiversity on our urbanized planet. More importantly, access to nature, and some degree of control on our relationship with nature may also be crucial for human wellbeing in cities, as Dr. Nilon suggests in the second half when discussing the potential environmental correlates of the urban racial unrest in Baltimore and Ferguson this year. Have a listen, and do share any thoughts you might have about how you relate to nature in your urban (or rural) environment. 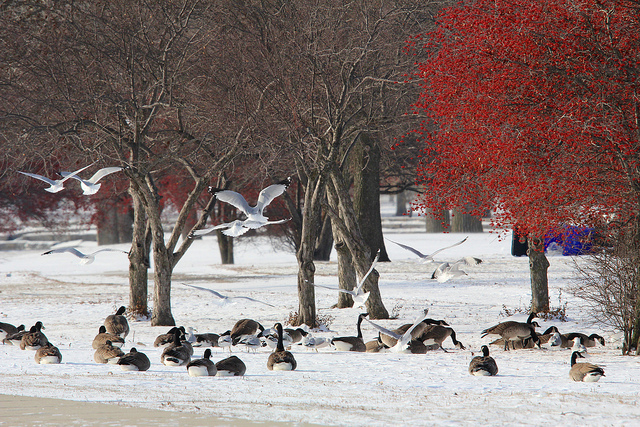 Inage: Nature in a Chicago winter. Photo © Madhusudan Katti, 2013.